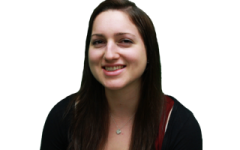 Weinberg sophomore Heather Menefee gives a presentation Monday on the Sand Creek massacre. The event, hosted by the Native American and Indigenous Student Alliance, was part of the first-ever Social Justice Week. 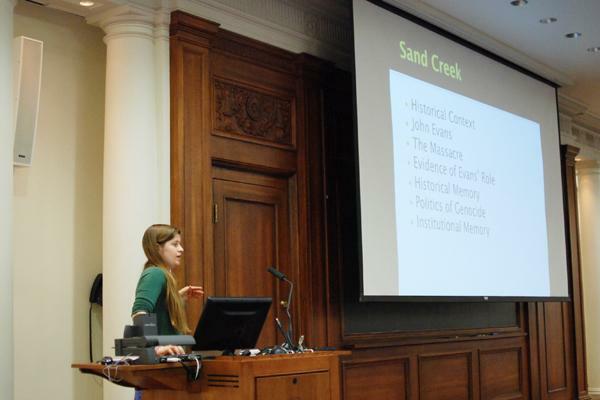 As University officials launch a committee to research Northwestern founder John Evans’ involvement in the Sand Creek Massacre, students hosted an event Monday night to keep Native American representation in the spotlight. This week, the Native American and Indigenous Student Alliance will raise awareness by participating in NU’s first ever Social Justice Week. The group screened the short documentary “The Sand Creek Massacre” on Monday, focusing on the 1864 slaughter of hundreds of Native Americans. Following the film, NAISA presented research it collected implicating Evans in the slaughter. Some historians and students claim Evans was directly involved in the Sand Creek Massacre, but the University says it is still searching for clear evidence of his connection. The film’s subject matter reflects a central issue for NAISA, which began petitioning in November for the recognition of Evans’ ties to the massacre. In February, the group spurred the creation of a University committee to examine whether NU benefited from the exploitation of Native peoples. The Evans study committee has its research efforts underway, completing background readings and setting an agenda. “We’re still very near the beginning,” said English Prof. Carl Smith, the committee’s chair. The committee already coordinates with other groups conducting similar investigations. Smith said he has been in touch with officials from the University of Denver — also founded by Evans — which launched its own investigation into the matter. Additionally, he spoke with the United Methodist Church, which is examining Sand Creek’s history in advance of its 150th anniversary. “It’s just something that’s never been settled, and there’s a lot of interest in these types of inquiries,” Smith said. After the University committee was formed, NU officials “tabled” NAISA’s petition, said Heather Menefee, the group’s co-president. The organization now focuses on building legitimacy and relationships while raising awareness on campus. One step toward that is seeking recognition from Associated Student Government, which led NAISA to ratify its first constitution May 7. The group also started to develop an official proposal to establish Native American studies at NU, with plans to submit it by the end of the quarter. NAISA’s participation in Social Justice Week represents another major strategy for the group — forging partnerships on campus. In conjunction with Alianza and For Members Only, this quarter NAISA is reviving the “Dress to Respect” campaign, first launched to educate students about wearing culturally sensitive Halloween costumes. “We’re revamping it for spring, targeting music festivals and the kind of costuming that goes into that,” Menefee said. NAISA also hopes to partner with the Office of Fraternity and Sorority Life to create programming geared toward the Greek community about cultural appropriation, she said. Alongside efforts by NAISA and the Evans committee, the University is increasing outreach efforts to Chicago’s Native American communities. Dona Cordero, assistant provost for diversity and inclusion, will attend the graduation ceremony this June for the American Indian Center of Chicago. Cordero said her presence is meant to strengthen NU’s ongoing relationship with the center, which has conducted research with the University for years. “The goal is to try to think about ways to be more engaged,” Cordero said. The AIC recently passed a resolution affirming its research partnership with NU and expressing its desire investigate Evans’ past.